I learned to read written crochet patterns in my late teens, but it was a few years more before I discovered the benefits of the crochet chart. Written instructions of a simple pattern are adequate, however, when the pattern becomes very complex, a written description is hard to visualize. It helps to “see” the stitches and how they flow together. Enter the crochet chart. Smart folks with lots of hookin’ experience have developed a system of symbols that represent the various stitches we use often. These symbols can then be arranged into a picture that approximates the arrangement of the crocheted stitches. By studying the chart, you can determine where to place that next stitch when the written instructions just aren’t clicking in your mind. Here is a legend of the very basic crochet stitches and how they’re represented on paper. (Pssst! These are US crochet chart images and terms. UK is a little different. See this blog post for clarification on that subject.) 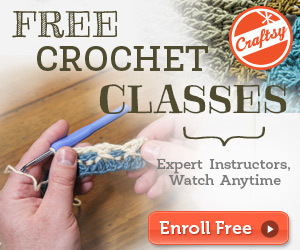 For a more expansive list of crochet chart images and terms, see this link. And here is a simple example of a shell stitch pattern displayed in a chart. Do you see the individual stitches and how they fit together? Does this help you visualize your work? 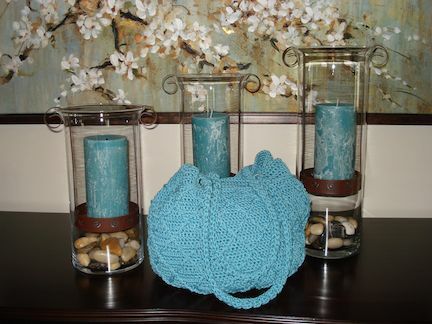 Here’s what this shell pattern looks like crocheted up in a completed project. This is a close-up of one of my Nestled Shells Crocheted Coin Purses. Learning to translate these picture charts can unlock a whole new dimension of crocheting for you. Most US patterns come with written instructions, however, I have come across many gorgeous patterns — especially those from other countries like Japan and Russia — that have no instructions. They simply provide a chart to follow. The ability to read the chart has allowed me to make some really beautiful pieces that would have been unavailable to me were I limited to written instructions only. In many instances, charts are provided when written instructions would be too long and cumbersome to spell out in detail. I suppose the designers figure that anyone tackling an extremely complex pattern will have the ability to read a chart, and in some instances that is definitely the easier option. As a designer, I now include a chart with any pattern that I feel may pose some questions for the customer. Written instructions appeal to some crocheters, but I am well aware that learning styles vary. Some people find a visual representation of the pattern much easier to follow. It’s fun to experiment and try new techniques, learn new skills! I hope you’ll give crochet charts a try and see if you can’t expand your crocheting repertoire. It’s freezing outside today — like sub-zero. And the wind … well, it’s whistling so hard through my bedroom windows they sound like they are screaming in pain. The schools were closed, and the dog refuses to go outside. So, obviously, I’m not terribly eager to leave the house either. I lit a fire in the fireplace to help the overworked furnace and I’m settling beside it in my comfy recliner to crochet. But what to make …. I finished up my latest project. I call it the Raised Diamonds Cinched Tote. It’s made from Sinfonia, which is available in about 10 colors at Hobby Lobby, and has a unique closure. The pattern will be available in a couple of weeks on my site and Craftsy. But while I’m finishing the work on that one, I’m itching to start another project. All this cold weather has me thinking of ponchos or wraps, something to add a layer of warmth. Now to hunt up a warm, cozy yarn to make it with.